Composer trading cards for the two final composers in March Music Madness. 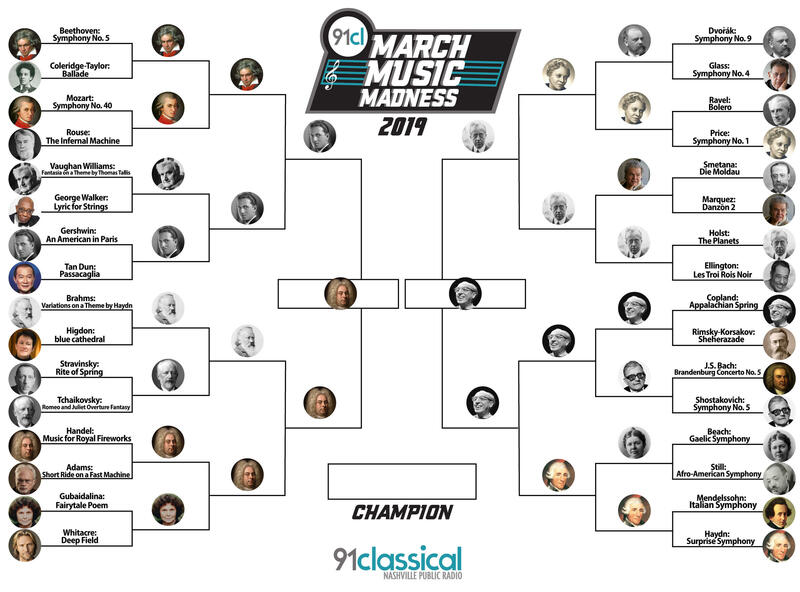 We're down to the final two pieces of music in this year's March Music Madness. In this last round Music for the Royal Fireworks is facing off against Appalachian Spring. Twelve thousand people attended a mere rehearsal of Handel's Music for the Royal Fireworks in the summer of 1749. The first performance, which included the fireworks themselves, was a complete disaster due to the damp weather which caused stray explosions, setting clothing and the pavilion ablaze. Four technicians were injured - two burned, one blinded, and one whose hands were literally blown off during the rehearsal. A review of the performance stated that, "very little mischief was done, and only two persons killed." The music itself was well recieved - even moreso than his enduring Messiah. The suite of dances (pyrotechnics or not) is still one of his most popular works. Almost exactly 200 years after the premiere of Music for the Royal Fireworks, choreographer Martha Graham commissioned Aaron Copland to write Appalachian Spring. Copland had already won the hearts of Americans and ballet-lovers with his previous works Billy the Kid and Rodeo. Not only was Graham herself one of the dancers in the premiere, but Merce Cunningham and Erick Hawkins, who also went on to found their own companies, were also participants. Graham's original story idea said, "This is a legend of American living. It is like the bone structure, the inner frame that holds together a people." The work fits neatly into Copland's tonal vocabulary, with its broad open intervals evoking wide, open spaces. Particularly memorable is Copland's use of the Shaker tune Simple Gifts, underlining the warm and humble values of the lead characters. Voting for the final round will be open until Friday morning, March 29. Use our handy google form to make your pick, and let us know who we left out of the bracket on our facebook page. One one more matchup remains in March Music Madness. With upcoming performances at the Ryman Auditorium and the Noah Liff Opera Center, Inversion Vocal Ensemble had opera scenes, art songs, and choral favorites ready to share.